A police informant says a former Halifax RCMP officer accused of stealing and trafficking cocaine is guilty and lying to cover it up. 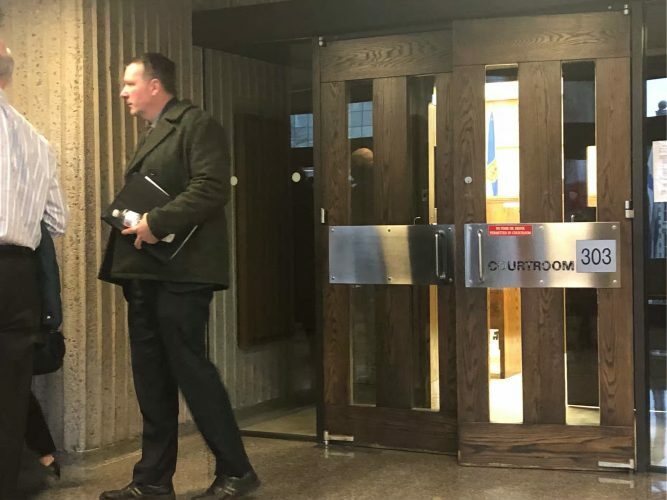 Scott Rowlings, a key witness in the Crown’s case against Craig Robert Burnett, testified in Nova Scotia Supreme Court Tuesday. “We were all involved,” Rowlings said. Rowlings told the court he, Burnett and associate Mike Kanasevich were part of a drug deal over the course of 10 to 12 months starting in 2010. Burnett, 51, is accused of stealing 10 kilograms of cocaine from an evidence locker between 2010 and 2011. The Crown alleges he gave the cocaine to friend and business partner Rowlings, who then gave it to Kanasevich to sell. Burnett was arrested in August 2016 following RCMP investigation Operation Handshake. Rowlings was given immunity in the case, in exchange for providing information against Burnett. Rowlings’ testimony began Monday, after the court was shown a recorded interview where Burnett denied any involvement in the case. In the video, Burnett told two RCMP investigators he was a “scapegoat” and was being used to protect the real drug supplier. On Tuesday, Rowlings told the court he and Burnett devised a story that Kanasevich fabricated that they were involved in the cocaine’s theft and sale, to destroy their reputations after being forced out of their business. Rowlings, Kanasevich and Burnett had all been involved in starting a medical marijuana company, Cannsource. The lead investigator of Operation Handshake, Insp. David John Astephan, previously told the court Kanasevich signed on as an informant in May 2016. From then on, Rowlings said, everything they told investigators played into the story that Kanasevich was trying to ruin them. He also said he lost his business and has had to endure 26 months of “vile intimidation and harassment” as a result. Defence lawyer David J. Bright is expected to cross-examine Rowlings on Wednesday. The judge-only trial is being heard by Supreme Court Justice James L. Chipman. It began on Jan. 21. Burnett has pleaded not guilty to seven charges, including two different breaches of trust, stealing cocaine with a value exceeding $5,000, trafficking a substance, transfer of property that was a result of an offence, obstructing a police officer by counselling a witness to lie, and intent to mislead. Correction: Feb. 6, 2019: An earlier version of this story misstated the location of the evidence locker. Incorrect details about the effect on Rowlings were removed.